← Simple Flaky Sticky Buns…………………. 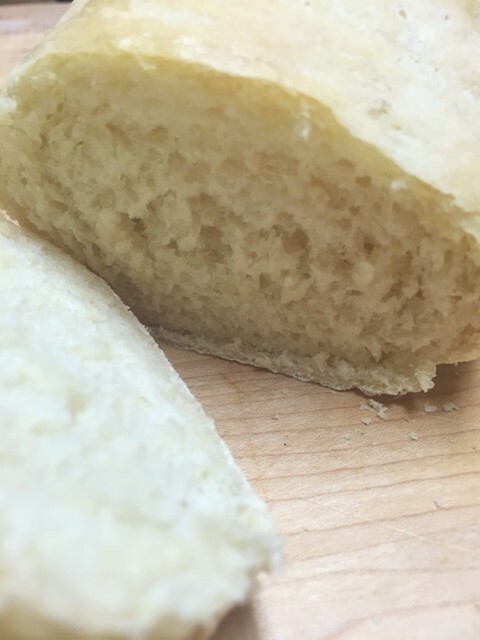 This is a very quick, simple French bread recipe. I found it on YouTube, but I changed a couple of things. It’s delicious. Everyone who I give this too, asks for their own loaf. A lot of folks are so intimidated by working with yeast. They get that scared look on their face, like YIKES. But really, do not be a-scared. Seriously, what is the worst that could happen? You dump it and start over? Its just flour and water and some yeast. I’m telling ya, once you make this and see how easy and yummy it is, you will make it again and again. 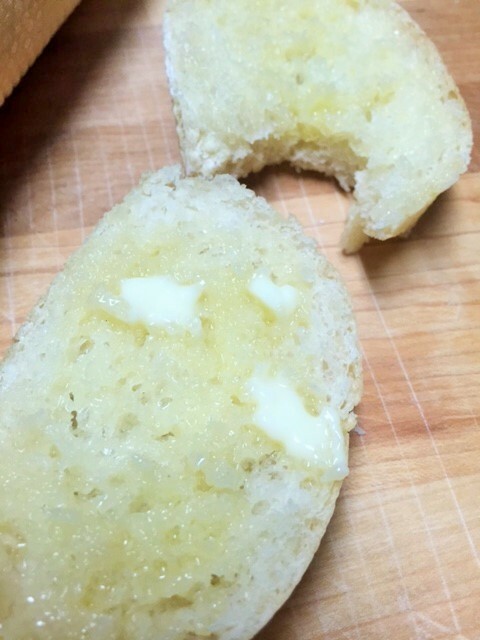 It’s delicious toasted, with butter…….or slathered in garlic butter and broiled…..or pizza bread…..or sandwiches. You’re gonna love it!! In a bowl of a stand mixer, with the paddle attachment, add warm water, yeast and sugar together. Yeast should be almost dissolved. Add the salt and 2 cups of the flour. If your dough is too sticky, add a bit more flour. Mix until the dough forms a ball. (you may not have to use all the flour). Remove the ball off the paddle and place dough ball in a large bowl. Cover with a clean dish towel or plastic wrap. Let it sit and double in size. About an hour. 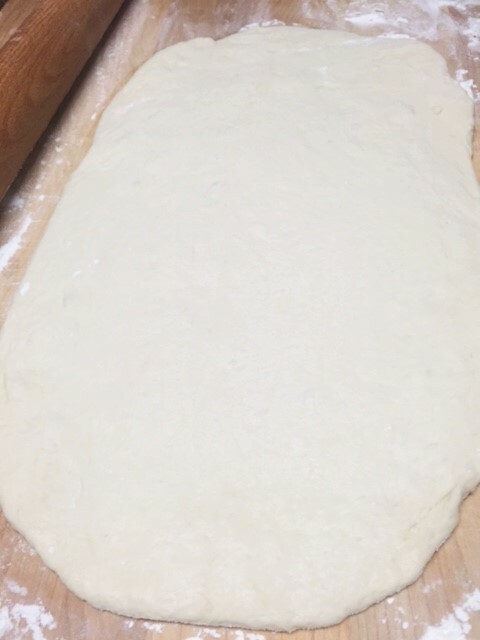 Place the dough onto a floured cutting board and roll out into a large rectangle…about 11″ x 15″. 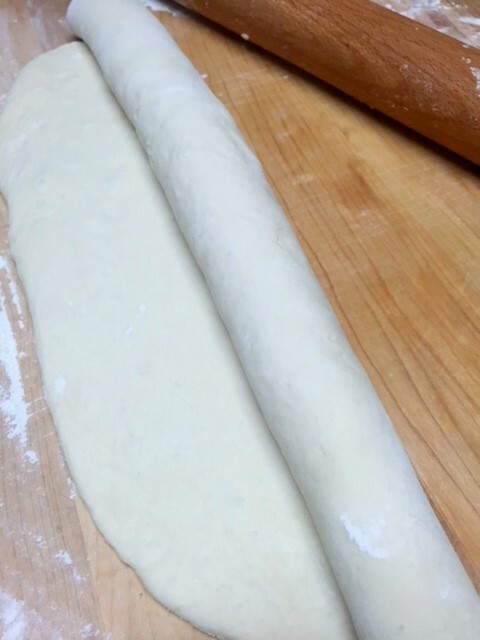 On the long edge, roll the dough up like if you were making cinnamon rolls. Gently lift it onto a baking sheet. 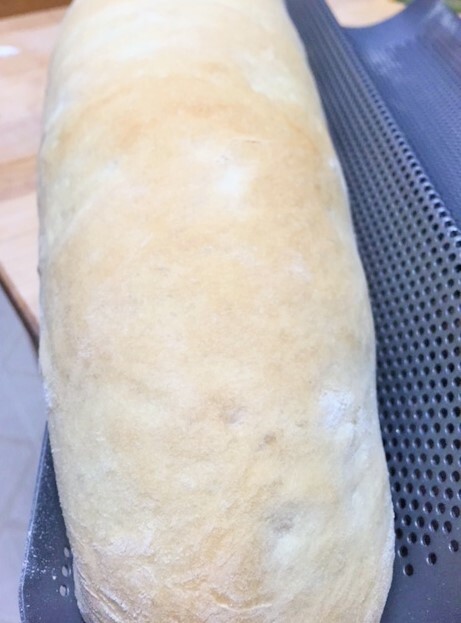 I used a french bread pan, but a flat baking sheet works. Cover with dish towel again for about 30 minutes or so, until it rises to your preference. 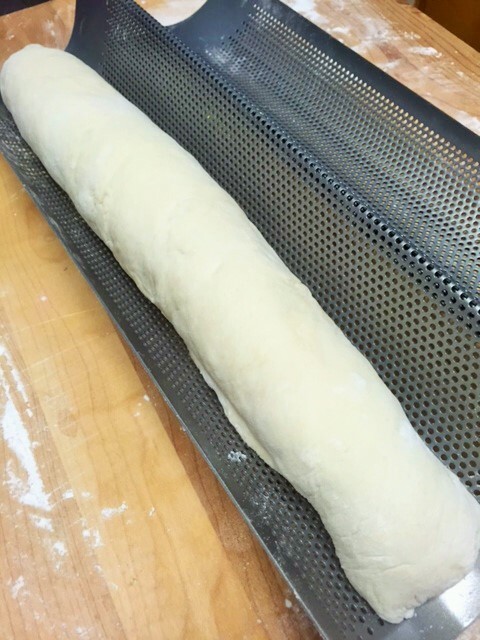 Bake in preheated oven….350 deg. for about 20 minutes or light brown. Ohhhhhhh, it’s gonna smell so good in your house. Get the butter ready. And maybe some jam…or honey…or olive oil. You better make 2 loaves! Ok I have a friend who gave me this recipe but only you gourmet types have the fancy pan. I LOVE this bread!! !